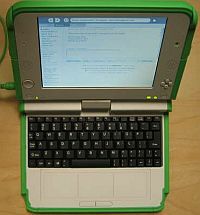 OLPC to offer XOs with keyboards for older children? While OLPC has generally focused on children in the 6 to 12 age range I've always felt that older pupils would also benefit from being able to use an XO at later stages in their education. Especially in places such as Uruguay and Peru where they've already extensively used them in primary school. However as most people will agree the keyboard of the current XO laptops isn't really suitable for extended use if you don't have very small hands and fingers. Even after two and a half years of regularly using XOs I'm still nowhere near as comfortable and quick typing on one compared to using a regular laptop. Finally, we are starting to look at making an XO version using a non-membrane keyboard. While not as water/dust resistant, it might be more suitable for older children. Combined with the fact that Uruguay is thinking about extending its one-to-one computing in education efforts to secondary schools I have to say I'm very excited about this potential development. Switching from the current XOs when you finish primary school and getting an XO-1.5 with a more suitable standard keyboard while also being able to switch between Sugar and GNOME (introduced with Sugar 0.84) seems like a very natural progression to me. Now of course the competition in the secondary school computing market is quite a bit tougher than in the very low age ranges. However I'm thinking that an XO-1.5 with a non-membrane keyboard definitely has the potential to give products such as Intel's Classmate PC a run for its money. A teacher in a working class Accra neighborhood gives a child a pencil, a book, a pair of shoes and the next day they don't come back with the child. I'm wondering if student owned XOs might be impractical here at this time - poverty? wishful thinking? Hope to vist the OLPC trial at Kanda #5 Primary Accra within the next few days. I Hope also that I will be able to immediately retract or modify my somewhat "anxious" question. Maybe I just haven't found the place to read about Sugar and practical educational problems. Here's one from 2008. I'm 61 years old. I have no problem typing on my XO. I don't think I have particularly small fingers, either.